1.2 billion iOS and Android apps downloaded during the holidays | Android Blast! Flurry is reporting that iOS and Android app downloads reached a whopping 1.2 billion during the week after Christmas. 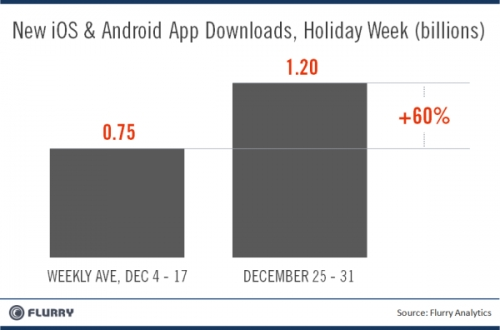 From Christmas to New Year’s Eve Flurry says over 1.2 billion apps were downloaded, representing a 60 percent increase compared to December’s weekly average. A lot of people got new smartphones for Christmas, but these numbers are still a little surprising. These numbers are great for mobile app developers!